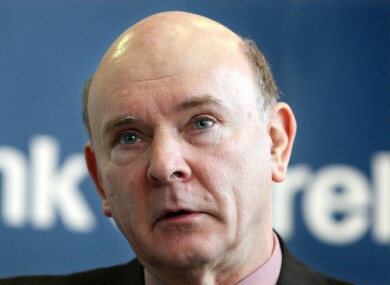 THE BROTHER of bankrupt former billionaire Seán Quinn, and the father of Peter Darragh Quinn, has said his family are unable to undo measures taken to move assets beyond the reach of the Irish Bank Resolution Corporation – because the bank will not offer its assistance. In an interview broadcast on Shannonside Northern Sound radio this morning, Peter Quinn said he had offered to mediate in talks between IBRC and other members of his family, hoping to broker a deal that would allow the Quinns to repay the full value of their debts to the bank. “You can never get a resolution, or any form of mediation, if you are not prepared to talk,” Quinn told The Joe Finnegan Show. “Anglo have made it very clear that they’re not prepared to talk. Quinn, a professional mediator who is a former president of the GAA and a former member of Northern Ireland’s Parades Commission, said IBRC – formerly Anglo Irish Bank – were not prepared to enter mediation with the family. He added that the movement of assets abroad – which he asserted had taken place before a High Court order stopping it, and entirely legally – could not be undone because the co-operation of other parties – including IBRC – was needed. It had been a “major problem” securing the co-operation from other parties, partly because some were third parties who did not want to cede part-control of their assets, and partly because IBRC was unwilling to offer its own flexibility. He said IBRC had also decided against co-operating with the family between the High Court’s original finding that three members of the family were in contempt of its order, and the date by which the Court wanted to see progress in that contempt being purged. The former GAA president also suggested that the family would be willing to take its case as far as the European Court of Justice if it was unsuccessful in its disputes at domestic level. “The one thing I have faith in… I have faith in the European justice system. If we get to Europe and we lose the case, I’ll accept that Seán was wrong. also said he had not seen a videotape, first obtained by the Irish Mail on Sunday, in which his son said he would have no problem lying under oath in a court. He said that while he did know what tone of voice his son had used, many members of the Quinn family – including himself, Peter and Seán – could occasionally be flippant and make remarks they didn’t mean. He also said he had not been asked for advice before Seán Quinn’s bets on the future of Anglo Irish Bank shares, saying that if he had examined the accounts, he would have been able to discern that the bank’s bad debt provisions were sufficient. Email “Peter Quinn: We can't bring assets back without Anglo's help”. Feedback on “Peter Quinn: We can't bring assets back without Anglo's help”.